The starch-statolith theory of gravity reception has been tested with a mutant of Arabidopsis thaliana (L.) Heynh. which, lacking plastid phosphoglucomutase (EC 2.7.5.1) activity, does not synthesize starch. The hypocotyls and seedling roots of the mutant were examined by light and electron microscopy to confirm that they did not contain starch. In upright wild-type (WT) seedlings, starch-filled plastids in the starch sheath of the hypocotyl and in three of the five columellar layers of the root cap were piled on the cell floors, and sedimented to the ceilings when the plants were inverted. However, starchless plastids of the mutant were not significantly sedimented in these cells in either upright or inverted seedlings. Gravitropism of light-grown seedling roots was vigorous: e.g., 10o curvature developed in mutants rotated on a clinostat following a 5 min induction at 1 · g, compared with 14o in the WT. Curvatures induced during intervals from 2.5 to 30 min were 70% as great in the mutant as the WT. Thus under these conditions the presence of starch and the sedimentation of plastids are unnecessary for reception of gravity by Arabidopsis roots. Gravitropism by hypocotyls of light-grown seedlings was less vigorous than that by roots, but the mutant hypocotyls exhibited an average of 70–80% as much curvature as the WT. 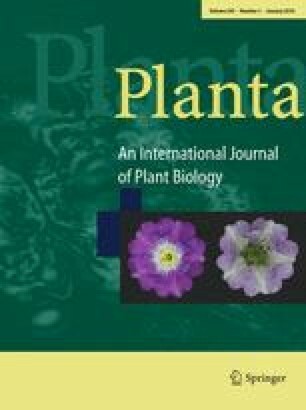 Roots and hypocotyls of etiolated seedlings and flower stalks of mature plants were also gravitropic, although in these cases the mutant was generally less closely comparable to the WT. Thus, starch is also unnecessary for gravity reception in these tissues.